Let the natural surroundings refresh you, relax in your whirlpool bath and then sit by your fireplace. Finally, rest in your soft King size bed until time to drink a cup of coffee in the rockers on the porch. Rustic Elegance, that’s a pretty good description of the ranch. Come spend a couple of nights or a week. Enjoy mountains, creeks and woods that surround our relaxing scenic lodging with WI-FI in all cabins, Jacuzzi’s, plush towels, fireplaces, king size beds, a/c, DVD players, Dish TV, kitchens and covered porches with gas grills. Are you ready to just relax and leave the world behind? Come to Panther Valley Ranch and enjoy a slower pace for a while. Let the stress melt away – just relax and enjoy the scenery. We are only 5 miles from downtown Hot Springs National Park but when you travel into our valley you feel you have left the world behind. The ranch has been featured in Southern Living magazine. Check out our excellent reviews on TripAdvisor. An authentic Western horse ranch over 100 years old offering scenic lodging described as rustic elegance. Spacious suites with corner Jacuzzis in a peaceful natural setting that restores you. This setting helps stress melt away. 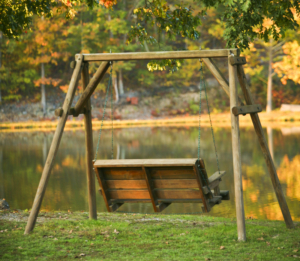 Relax, read a book or just sit in the swing by our little private lake and watch the horses graze. AWESOME! Great getaway for the family and still close enough to Hot Springs for excursions. It was our first time to the area, but won’t be our last thanks to this awesome ranch.